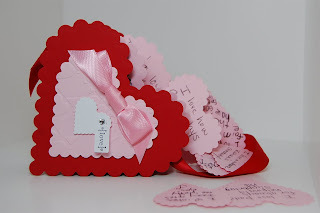 My boys and I have been placing love notes for each other in this cute little heart box since February 1st. Tonight at dinner we will read them. I can't wait to see what they wrote. The only instructions I gave them was to write things they love about all of us and to make sure they write the same amount for each person. Ultimately, these love note will make a fabulous Valentine's Day layout! OMG what a great idea Maureen! I can't wait to hear what they wrote.